the problem is guild war, if u find better solution i think a lot of players don\'t lose Guild war time. What u think to move to sunday morning? or Sunday night where almost players can join? Personally Id rather See Guild wars be where they are currently or on a Sunday evening. As this would be the most logical. Considering the calling resets would be taking up much of a Sunday morning reset. ; or many players Religious Faiths would take precedent over it. Also we must make the compromise that the over all goal with the DEV\'s as well as my own goal with this Time sheet is World wide Accommodation. 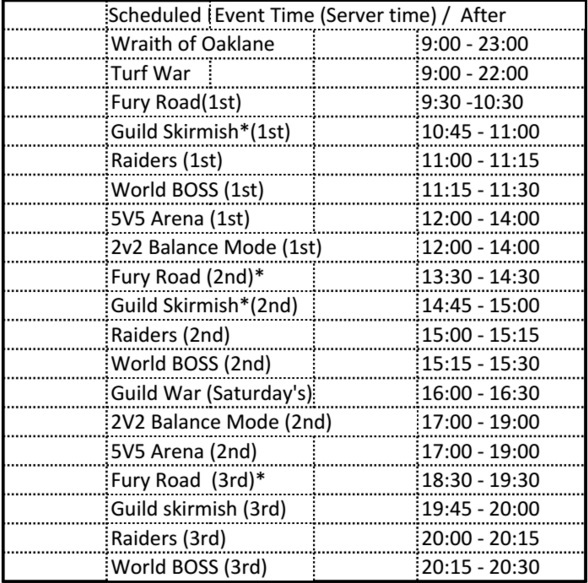 The highlight/main attraction of this time sheet is the additional guild skirmish times and the additional fury road times. Giving players not only a more Vast opportunity to make these events, but also reduce the over all lag of the events threw out the day. You will also see the 5v5 and 2v2 Balance modes in this sheet extending additional time giving players a larger window gap to attend. 2019-4-21 03:00 GMT+8 , Processed in 0.055392 second(s), 40 queries .